Beaumont Hospital has introduced a novel Masters degree course in organisational change and leadership development for its staff. The two year part-time course has been devised by Beaumont in a three-way partnership with the Business School at Dublin City University and the Institute for Leadership Development and Healthcare Management at the Royal College of Surgeons, Ireland. Speaking at the formal announcement of the project, Beaumont CEO Liam Duffy said that health care providers are increasingly seeking to deliver the highest possible quality of service in the most efficient and effective manner possible. "This new MSc programme is customised to address current and emerging challenges in the wider healthcare environment and also encompasses many of the organisational development activities currently underway in the hospital," he said. The programme comprises six taught modules and an action orientated dissertation. Its specific objectives are to enable change within the hospital, to empower staff and develop their leadership potential, to improve efficiency and to contribute to the development of Beaumont Hospital as a provider of best quality healthcare services. The programme, which is accredited by the National University of Ireland, is also open to staff from other hospitals in the North East Region region. The individual cost is €8,500 per year with each participant paying half and the balance funded by his or her employer. The first course has commenced with 20 participants from a variety of management disciplines within Beaumont. Speaking at an event to formally acknowledge the agreement between the three partners to the course, the Tanaiste and Minister for Education & Skills, Mary Coughlan TD, said it was important to the future of Ireland that the capacity for change within all organisations be improved by enhancing leadership qualities within them. She said that a partnership approach between academic institutions and individual organisations, such as the one involving Beaumont, DCU and the RCSI, helped to create strong synergies and practical benefits for everyone involved, and was ultimately for the benefit of the wider community. There was enormous value to be derived from investment in research in the clinical environment, she added, which went well beyond just the academic. Such investment helped to embed multinational companies in the Irish economy and provided opportunities for indigenous entrepreneurs. 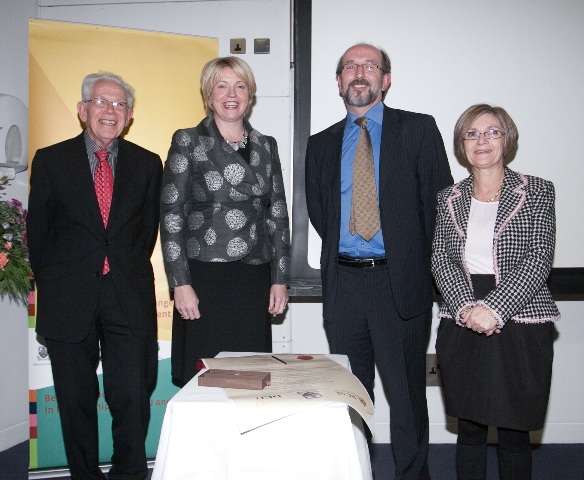 DCU President Professor Brian MacCraith and RCSI President Professor Eilis McGovern.